2. Be a pineapple. Stand tall, wear a crown, and be sweet on the inside. 3. We have a ‘latte’ to be thankful for. 4. Never let the fear of striking out keep you from playing the game. 5. If the words you spoke appeared on your skin, would you still be beautiful? 6. I may not be there yet but I am closer than I was yesterday. 7. Even if hate has a bullhorn, love is louder. 9. Kind is the new cool. 10. If your dreams don’t scare you, they aren’t big enough. 11. None of us is as smart as all of us. 12. From small beginnings come great things. 13. Make today so awesome yesterday is jealous. 14. Look with kindness and you will find wonder. 15. Be awesome, be amazing, be you. 16. Today a reader, tomorrow a leader. 17. Be somebody who makes everybody feel like a somebody. 18. In a world where you can be anything, be kind. 21. Strive for progress, not perfection. 22. Sometimes the bravest and most important thing you can do is just show up. 23. In our class we don’t do easy. We make easy happen through hard work and learning. 24. You’re here. You take up space. You matter. You're here. You take up space. You matter! 26. Throw kindness like confetti. 27. The earth without art is just eh. 28. Try again. Fail again. Fail better. I love this sign! I can't take full credit for it though… it was ordered from one of my fully customizable "insert your own text" sign listings. However, I love it so much, I added it to my shop (you pick the size, wood finish and text color). It would be a great teacher gift, coach gift… classroom decor, locker room decor… really, it's an "anywhere sign"! 29. Never bend your head. Hold it high. Look the world in the eye. 30. Let’s root for each other and watch each other grow. 31. To have good friends, you need to be one. 32. If you’re doing what everyone else is doing, you’re doing it wrong. 33. The beautiful thing about learning is that no one can take it away from you. 34. Whether you think you can or you think you can’t, you’re right. 35. Be the reason someone smiles today. 36. All we have to decide is what to do with the time that is given to us. 37. This is what a leader looks like. 38. You’re going to rattle the stars, you are. 39. If it doesn’t challenge you, it doesn’t change you. 40. It’s a good day for a good day. 41. You are braver than you believe, stronger than you seem, and smarter than you think. 42. 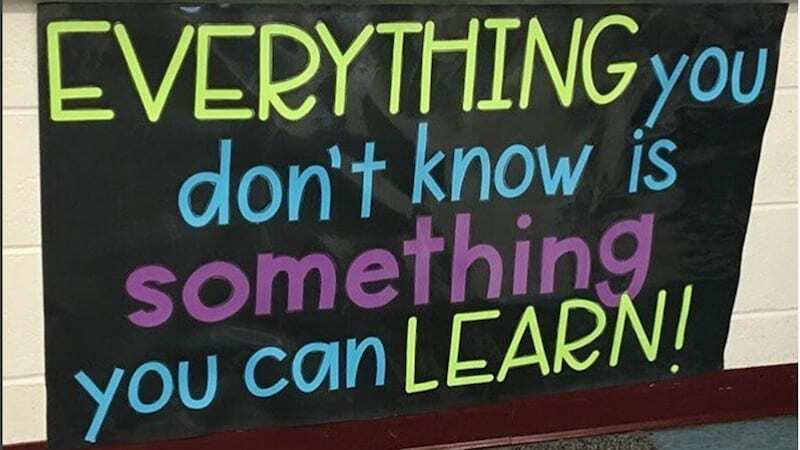 Everything you don’t know is something you can learn. 43. Mistakes help me learn better. 44. We may all be different fish, but at this school we swim together. 45. Say what you mean but don’t say it mean. Dana's 6th Grade GATE classroom! 47. You will never regret being kind. 48. The expert in anything was once the beginner. 49. Excellence is doing ordinary things extraordinarily well. 50. Don’t let anyone dull your sparkle. What are your favorite classroom quotes? We’d love to hear in our WeAreTeachers HELPLINE group on Facebook. Plus, inspirational posters for teachers.